Prime Minister Moses Nagamootoo has signalled the need for Guyana and the rest of the region to be a zone of peace, free from the scourge of money laundering, piracy and other illicit activities. Prime Minister Moses Nagamootoo today at the opening of the two-day CANSEC Conference at the Guyana Marriot hotel. 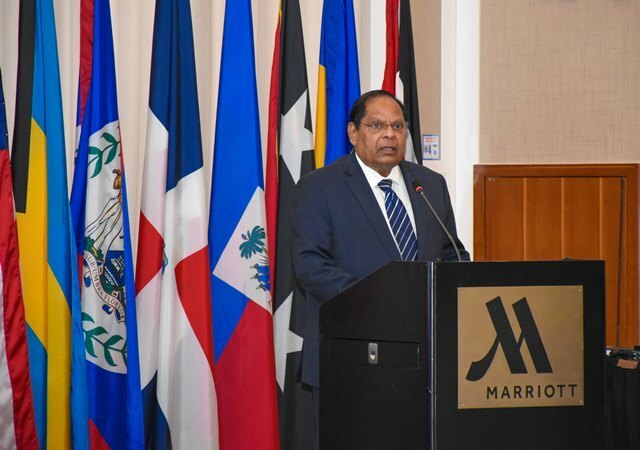 Addressing the opening of the 16th annual Caribbean Nations Security Conference (CANSEC), being held for the first time in Guyana at the Marriot International hotel, the Prime Minister told the delegates that the region must be clean and secure. Under the theme “Unifying regional action to counter transregional and transnational threat networks,” the two-day regional conference will see defence and public security leaders from more than 20 nations examining threats to the region’s stability, sharing information about operations and strategies, and defining avenues for better collaboration to strengthen security in the Caribbean. Delivering remarks at the event, the Prime Minister stressed the need for cooperation from organisations such as CANSEC which provides quality networking, to allow for free and safe societies. “We need your cooperation to continue to make our region a zone of peace, a zone that is free from the scourges of money laundering shouldn’t be seen as a haven for dirty money, scourge of piracy, a scourge of terrorism. We want to keep our region clean and secure,” magistracy the Prime Minister said. He said while Guyana has always dreamt of being a piece of paradise, that it is a zone of peace, it must also be a zone of stability. “But we cannot do that alone. CANSEC offers us one significant platform where we can share our resources and pool our ideas, yes, we can become a viable part of the world,” he told the grand opening. According to the Prime Minister, over the last 30 months, the government has seen some of the biggest interceptions of illicit drugs and have been able, even with very limited resources, to waylay illegal flights and aircrafts into Guyana, detect illicit airstrips, and intercept large trafficking shipment. All this, the PM stressed were accomplished due to networking. “When we look back where we started 30 months ago, when we ask can we do it, we can answer positively, yes we can. We have been able through networking, sharing of intelligence, usage of computer, and with the fascination that accompany computers and the information they provide us, to be able to intercept those who have been involved in acts of piracy,” he said. Nations invited to participate alongside Guyana and the U.S. during this year’s conference include: Antigua and Barbuda, the Bahamas, Barbados, Belize, Dominica, the Dominican Republic, Grenada, Haiti, Jamaica, St. Kitts and Nevis, St. Lucia, St. Vincent and the Grenadines, Suriname, and Trinidad and Tobago. Nations participating as observers include Brazil, Canada, France, Mexico, the Royal Netherlands, Spain, and the United Kingdom. CANSEC is sponsored annually by SOUTHCOM, the Defense Department’s unified command responsible for U.S. security cooperation with partner countries in the Caribbean, Central America and South America. The opening conference also saw the attendance of Minister of State Joseph Harmon, Minister of Natural Resources Raphael Trotman and United States Ambassador to Guyana Perry Holloway. Prime Minister Moses Nagamootoo with some members of the CANSEC delegation during a photo op.